Step 1--Make a sankalpa to hear ONE mantra. A sankalpa is a resolution or determination to do something. So the 1st step is to tell the mind to resolve to just hear one hare krishna maha mantra. Radha - She who is the bestower of ultimate divine bliss. Rasesvari - She Who is the Goddess of the rasa dance. Rasa-Vasini - She Who always lives with the rasa dance. Rasikesvari - She Who is the Goddess of those who relish divine mellows. How to overcome Anarthas ??? Once a college student confided to Srila Sarawati Thakur, " We are doing wrong. We know it is not good, yet we commit sin again and again, then repent again and again. Why do we fluctuate like this ?" festival time are two new books. This is a beautiful story - it might inspire you! Bhakti Caru Swami inspects the dahl used to prepare meals for Ujjain's school kids. 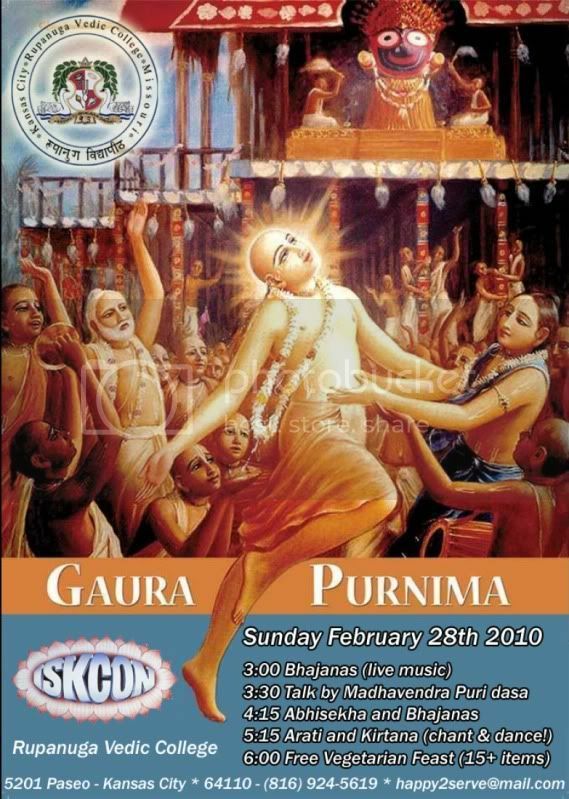 Historically, a guru tends to be an autocrat, but Srila Prabhupada's vision of thousands of gurus working cooperatively within a single institution is unique and bold.